Thanks for sharing so much of yourselves in this episode. It was very heartfelt, moving and not sappy at all. 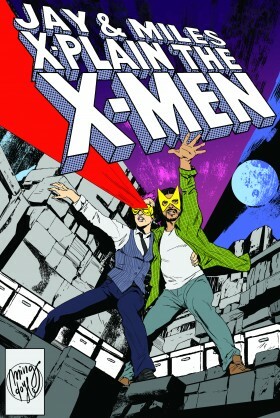 You both continue to amaze with the depth of meaning and heights of silliness you can extract from the X-men canon. Have a great vacation! This episode. The FEELZ. I had all of them. I’m not choked up, I’m not choked up…. Wow, I loved this book when it was published but it means more to me today because have a deeper understanding of the characters and history. When I purchased this issue, it was my first major event issue and I was delighted. For the next 6 years, I avidly read all the books and was happy to see a functional relationship that really worked amid all the other emotional messes that populated the X-verse. I was disapointed to find out after picking to books back up that they were on the verge of a divorce at Jean’s death and Scott was having a emotional affair with Emma Frost. I really wish that a writer would find a way to redeem Scott’s relationships with Jean and Professor X, even if they are just ghosts. Your argument over whether or not Jean/Rachel could be compaired to Catelyn/Jon Snow brought back something I meant to ask when I heard the Days of Future Past episode: who IS Rachel’s Mom in her timeline? Is it ever stated clearly? Let’s go back to that Days of Future Past episode, since it happened before all the subsequent time-travelling mess, and the timeline is supposed to be simpler. When you explained that episode, you said that before old Kitty travelled into Young Kitty’s body, and prevented Senator Kelly’s murder, the timelines were similar, and they split on the Kelly dying/not dying event. Hence, those times were simpler. Well, not really: even back then, Jean Grey had just died on the moon. But a few issues later, her daughter from the future sends Kitty travelling in time. Because all this happened, editorially, years before the “Jean is alive” retcon, weren’t those timelines supposed to be different from the start, one with Jean dying on the moon, and the other with Jean living to have Rachel? Reading “Phoenix: The Untold story” sort of made things clearer later: the original story didn’t kill Phoenix on the moon, but de-powered her instead. So THAT would be Rachel’s Mom? But wouldn’t that mean Claremont actually knew that when he wrote DOFP, hence knowing that Kitty going back to the past was dommed to fail since it was not HER OWN past. Or was the “Future Past” story written in advance, when they still thought Jean would just be de-powered on the moon, but when Jean did die, they still went along with the story with Rachel in it? And of course, after the retcon happens, it raised another problem: if Phoenix was kept alive in Rachel’s timeline, depowered or not, wouldn’t she eventually run into the “real” Jean when the Fantastic Four shipped that one out of Jamaica Bay. Or are we supposed to assume that if Phoenix hadn’t died on the moon, she would have been the real Jean Grey from the start, just because it makes things simpler? Sorry for opening that can of worms, but I just meant to say that Rachel (you, from the podcast, not Phoenix) shouldn’t diss Miles’ Catelyn/Jon comparison so definitely: after all, even though she absorbed the memories of Madelyn and Phoenix during Inferno, in the issues you mention, she is still the Jean-not-Phoenix retcon who is facing the daughter of Phoenix, who even took Phoenix as her own codename and power. It’s kind of as if Catelyn had absorbed the memories of Jon Snow’s mother: he would still be the son of “the other woman”. Just like Rachel is the daughter of “the other woman”, since Busiek’s retcon idea depended on that very fact, Jean is ANOTHER woman, not Jean Grey. And even if Jean heard teh argument “but Mom in my timeline YOU are Phoenix (or maybe you’re not but the FF never shipped the real you out of Jamaica Bay since everyone was busy being slaughtered by anti-mutant sentinels, so yeah, let’s say Phoenix was the real you), for Jean Grey, Phoenix would still be her Nemesis, and Rachel, still the Official Daughter of Phoenix, so I’m not sure she’d care for the distinction. Rachel could be be the biological daughter of Jean/Phoenix because in that timeline instead of being 2 seperate people, it was the merged identity that Chris originally thought up when they started the story. Also, John is most likely the son of Brandon Stark and Ashara Dane. Ned’s sister did NOT have a baby with Arys. She was involved with Rheagar and THAT baby was taken by John Connington and is the one that is being raised as young Griff or taken by Howlen Reed and is Meera Reed.